Yes and no. You may only upload one timesheet per interpreter. If you upload a second timesheet when there is only one interpreter assigned to the request, then the original timesheet will be replaced. If there is more than one interpreter, you can upload a timesheet for each of the interpreters. Again, however, uploading a second timesheet for the same interpreter, even when there is more than one, will overwrite the first timesheet for that interpreter. If you typically only use a single interpreter on a request/job, then you will not see any change in how to upload a timesheet. The biggest change you will see is that you no longer have to download a timesheet to view it. In fact, the download button has been removed. If you click the link for the timesheet, it will open in a new window in your browser and you can then print it or save it as you wish. This works the same way for both single and multiple interpreters. To add a timesheet when there are multiple interpreters, you need to choose the interpreter from the drop down box and click the upload icon to the right of that drop down box. This brings up a file dialog box. You just select and save it. Once you have done this for both (or more) interpreters, the Time sheets box will look something like this. 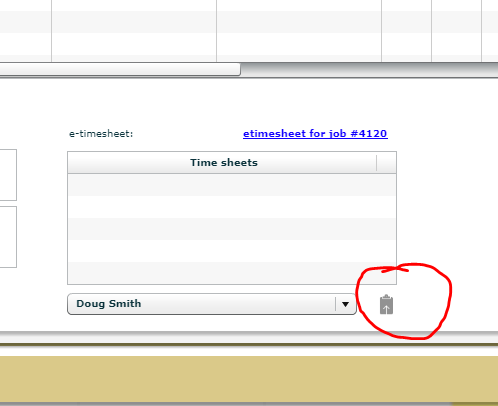 The links to the timesheets will now open in a new browser tab and you can view, print or save as you like.